This ranking shows the largest applicants1 at the EPO, indicating their country of origin2. 1 This is the ranking of the main consolidated applicants at the EPO in 2017 (first-named applicant principle). It is based on European patent applications filed with the EPO, which include direct European applications and international (PCT) applications that entered the European phase during the reporting period. Applications by identifiable subsidiaries, not necessarily located in the same country, are allocated to the consolidated applicants. 2 The countries refer to the country of residence of the headquarters. This ranking shows the largest applicants1 at the EPO (first-named applicant principle). It indicates the total number of European applications filed with the EPO for each and the split between direct European applications (Direct) and international (PCT) applications that entered the European phase (PCT regional) during the reporting period. 1 This is the ranking of main consolidated applicants at the EPO in 2017. It is based on European patent applications filed with the EPO, which include direct European applications (Direct) and international (PCT) applications that entered the European phase (PCT regional) during the reporting period. Applications made by subsidiaries are allocated to the consolidated applicants. 2 PCT applications that entered the European phase during the reporting period. 3 Commissariat à l'énergie atomique et aux énergies alternatives. 5 Fraunhofer-Gesellschaft zur Förderung der angewandten Forschung e.V. A breakdown by category of applicants requesting services from the EPO shows that 69% of them were large companies, 24% were SMEs and individual inventors, and 7% were universities and public research institutes. 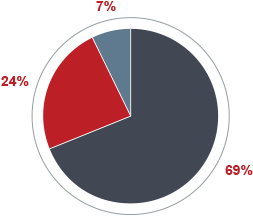 This shows that a significant proportion of applicants at the EPO are smaller entities. 1 The evaluation is based on a representative sample of patent applications treated by the EPO in 2016. 2 It refers to the European Commission definition of SMEs (2003/361/EC). Data available in government and commercial databases as well as on company internet sites are analysed to allocate the applicant to one of the four categories. Depending on the company policy, the cross-ownership criteria can be difficult to evaluate. To ensure that the results remain statistically significant, no analysis per country or industrial sector is provided.